The Road הדרך | مشوار – We come from different places, and where we are going – well, we don’t always know. But as we travel this road, each on our own individual path, we share the journey. Neta Elkayam and Luna Abu Nassar brought an exhilarating and moving evening of song, very aptly titled The Road, in Palestinian Arabic, Moroccan Arabic and Hebrew, to the stage of the Confederation House in Jerusalem last night, with Amit Hai Cohen on the piano, Stav Lipitz on drums, and Adi Gigi on the bass. And if the oud was not there as an instrument on the stage, it was there in spirit, in the musical expression of this cultural crossroads. Singer-songwriters Neta Elkayam and Luna Abu Nassar are dramatically different in their musical roots and expression. Their joint performance resembles a composed salad, in which the different elements remain distinct, yet brought together on the plate and on the palate, create a new experience, aesthetic and delicious. Elkayam connects to her Maghreb roots of Jewish-Moroccan music, singing traditional and original songs in Moroccan with a contemporary feel. The music reflects Arabic, Spanish, French and Hebrew influences. Elkayam sings with the vibrant warmth of the Maghreb sunshine. Expressive and dynamic, her presence is like that of the storyteller of oral traditions, creating the feeling of community, as people in the audience clap and sing along on the refrains. Luna Abu Nassar is poetic and enigmatic, invoking a sense of intimacy and mystery with delicate, edgy, introspective, original songs in Palestinian Arabic and Hebrew; hers is the quiet voice that draws the listener in close, the song that enters mind and heart. Abu Nassar’s music corresponds with contemporary indie-rock, with intimations of alternative folk and hip hop. Together they created an evening that drew on both their strengths, sharing the space and creating space for one another, entering each other’s songs with a spirit of discovery, generosity, and close listening. It was a night of mesmerizing beauty and joyous music, with the warm feel of spontaneity. The evening opened with Su’aal (Question), the first track on Luna Abu Nassar’s second album Ma’arbolet (Whirpool 2017). Elkayam’s voice merged harmoniously with Abu Nassar’s, in the piercing, poignant lyrics: Every day the same question/about my role in the end (translation from online translation software). The rapport and close connection between the performers onstage were terrific, with a vivacious feel of improvisation that reflects careful attention to detail. Pianist and composer Amit Hai Cohen is Neta Elkayam’s life and work partner, and it was fascinating to see him so utterly immersed in the next song – Abu Nassar’s Kishoof (Spell), which she sang solo – one hand on the piano keyboard, and one deep inside the strings. Luna Abu Nassar performed several songs from both her albums, including Mishwar, Bint Meen, Rakevet, and Asaper Lakh, the title song from her debut album. Captivating as always, her performance also held a promise for the future, as she told the audience that she is currently learning to play the oud. 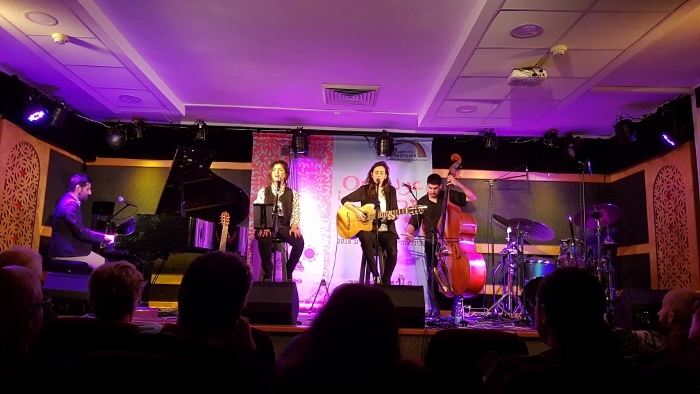 In sharing with the audience their individual and musical traditions, Elkayam and Abu Nassar also each chose to perform a song that reflects women’s voices from their respective traditions, voices that all too often are muted, and not heard. Elkayam sang a song by Simone Tamar, a Jewish Algerian singer who died young, at age 47, after recording two albums. Abu Nassar returned to the stage, joining in Elkayam’s song A Yana, then the entire band sang the lively Ya Qamar (qamar means moon), a children’s song by Remi Bandali, a Lebanese singer from a well-known musical family, who achieved popularity in her youth, but had not performed since. Last night her song rang out, fun and bouncing with energy. The evening closed with a quiet tune, a harmonious duet. The Jerusalem International Oud Festival continues through November 17, 2018, and is under the artistic direction of Effie Benaya, General and Artistic Director of the Confederation House. The full program may be found on the Confederation House website.